The intent of the Plant Information Center (PIC) is to connect the research community and the general public (including school children) so that primary research materials owned by the University can be made available to these new audiences and that expert knowledge may also be shared. PIC is also driven by the desire to nurture the interest and enthusiasm of these audiences in the study of trees, plants, and natural history. We believe PIC will help people observe nature more closely and more knowledgeably so that they will be led to protect our natural heritage. We will realize this vision through sharing the resources of the UNC Herbarium in a virtual way over the Internet. 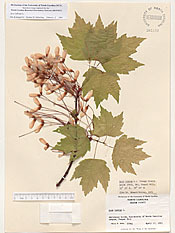 A herbarium is a museum collection of plant specimens with associated label and research data. Herbaria are the fundamental documentation of plant diversity. The UNC Herbarium, founded in 1908, includes over 600,000 labeled museum specimens of plants, algae, fungi, and fossils. It is the largest collection in the southeastern United States and specializes in the collection of plants of this region.